AppleInsider reader Thomas snapped a photo of the Apple homage in Hanover, the German city where the annual CeBIT technology trade show was held last week. 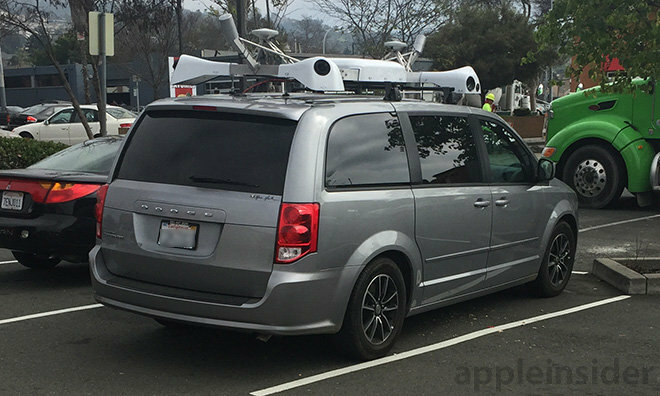 The German Dodge sports the same style of X-shaped roof rack as Apple's, but all of the sensors appear to be mockups. 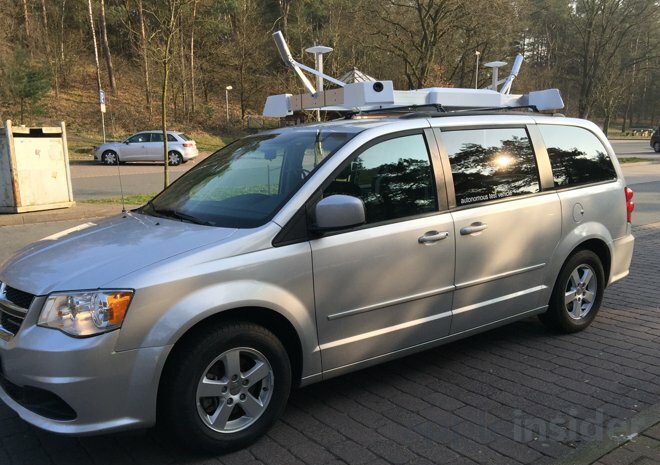 Solid metal tubes take the place of the Velodyne HDL-32 LiDAR units found on Apple's vans, while what appear to be plastic grommets serve as "cameras" in each corner. The Apple vans' high-sensitivity GPS antennas are replaced by PVC saucers on square metal tubing. A real van. Click for larger. On the vehicle's left rear door, we find a convenient label identifying the van as an "autonomous test vehicle." Many have speculated that Apple's vans are designed for that purpose, though most agree they are in fact meant for a new digital mapping program. It remains unclear why the owner of this particular van felt it necessary to ape Apple's vehicles. Given the clear and likely incorrect labeling, it seems that the unit could be meant as a prank, or perhaps designed to simulate Apple's vehicles in a video.